Jean-Marie Okwo-Bele, Director of the WHO Department of Immunization, Vaccines and Biologicals, told reporters at the UN headquarters in Geneva that the impact of vaccines on people's lives is “truly one of the best things that one could see out there”, likening the impact to that of providing safe water to hundreds of millions of people around the world. “But we can do much better,” Dr. Okwo-Bele said. Immunizations currently avert 2-3 million deaths each year from diseases such as diphtheria, measles, pertussis, pneumonia, polio, rotavirus diarrhoea, rubella and tetanus. He said an additional 1.2 million deaths every year can be averted if some of the newest vaccines, for instance against meningitis, pneumonia and diarrhoea where these diseases occur. He said 250,000 deaths due to cervical cancer in the near future could be saved if the vaccines are extended to all girls today. Dr. Okwo-Bele also said polio is on the verge of eradication. Moreover, he said measles can be eliminated all over the world. Already, measles in Africa has gone down dramatically and the disease is being eliminated in the Americas and in the Pacific region, including China. World Immunization Week, which takes place in the last week of April every year, is an opportunity to remind families and communities how effective vaccines can be, and to encourage people to take action to ensure that more children, and increasingly people in other age groups, are immunized against deadly and debilitating diseases. This year, with the slogan “Immunization for a healthy future. Know, Check, Protect”, WHO and its partners are encouraging people to learn more about which vaccines are needed to prevent deadly illnesses, to check to see if their family’s immunizations are up-to-date, and to seek out vaccination services so that all family members are protected. Health workers will be focusing on direct communication with the general public and Dr. Okwo-Bele said this will be done by encouraging countries to deliver information directly to people’s mobile phones and social media accounts. According to WHO, one important driver of the progress made to date has been the Expanded Programme on Immunization (EPI), which celebrates its 40th anniversary in May 2014. The EPI has been established in all countries. Priority is given to some 40 nations where routine immunization coverage is lowest, and to the districts within those countries where children are least protected. When EPI was established, just 5 per cent of the world’s children were receiving basic immunizations. Now this figure stands at more than 80 per cent. In response to a reporter’s question at the press conference in Geneva Wednesday, WHO acknowledged that successful vaccination campaigns and the disappearance or near-disappearance of diseases has bred some complacency. "The important thing about complacency is that the number of susceptible people who resist or reject facts and information will accumulate, and the disease will come back, as you're seeing in the United States with measles and whooping cough, which are terrible diseases,” said WHO’s Tracey Goodman, who works with Dr. Okwo-Bele. She was referring to the recent outbreak of measles in the United States, where reportedly more than 100 cases in 13 states were reported by mid-April, the bulk of them in California and New York City. “As soon as people see diseases return, people realize they could have done something,” Ms. Goldman told reporters, "It's a tragedy that could be avoided." 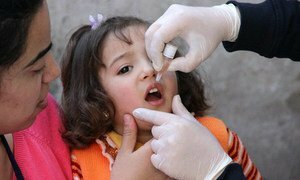 With the recent discovery of a new case of polio in a six-month-old boy in Iraq, the United Nations and it partners, warning that the crippling virus still poses a threat to children across the Middle East, have re-launched a massive vaccination campaigns in Syria, Iraq and Egypt, aiming to reach 22 million children by Thursday.